A man is treated on Holloway Street in Durham for wounds after he was struck in the head with a gun on July 8. Photo by Leanora Minai. In July, I rode with Robert Gaddy, sergeant of the Durham Police Department's High Enforcement Abatement Team (HEAT) for District 1. He and other officers on the team enforce "matters of drugs, narcotics, vice-related issues," Gaddy said. "We also do gang enforcement, as well as prevention and education." 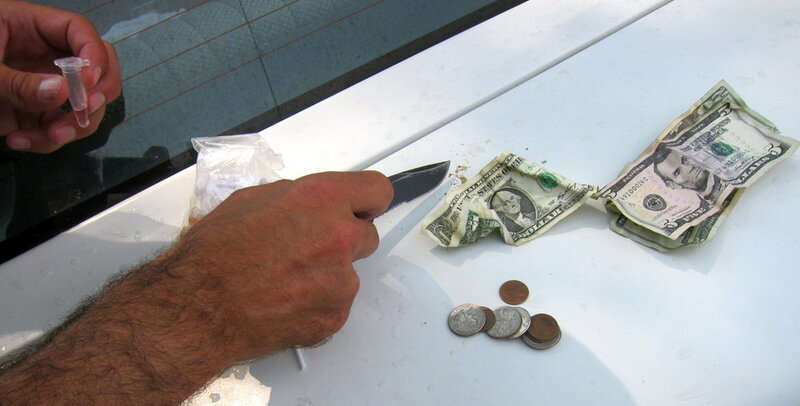 After a traffic stop, an officer tests bills for the presence of heroin. Photo by Leanora Minai. Within moments of my ride, Gaddy pulled behind a fellow Durham police officer's cruiser to assist with a traffic stop. Before I could adjust the settings on my video camera, Gaddy had hopped from our car. He ran to help a fellow officer prevent the motorist from swallowing drugs. Police recovered "nickel bags" of marijuana from the car. Officers tested cash, and it came back positive for the presence of heroin. The motorist went to jail, and a tow truck pulled his car from the scene. Soon after that stop, we drove toward Edgemont Park, where people were loitering and drinking in the pavilion. I got an education in gang graffiti. "Rollin 60," reportedly representing the Crips, marked a picnic table, pavilion post and ceiling. A Durham police officer points to "RSC," which stands for Rollin' Sixty Crip. Photo by Leanora Minai. Gang culture won't play prominently in my short film, but I found the sights relevant and important to observe. Lights and sirens ended my ride with Gaddy. The police radio in the car crackled with a call of a shooting on Holloway Street near Chester Street. Turned out, the man wasn't shot. Someone hit him in the back of the head with a blunt object, possibly a pistol. It was aggravated assault.